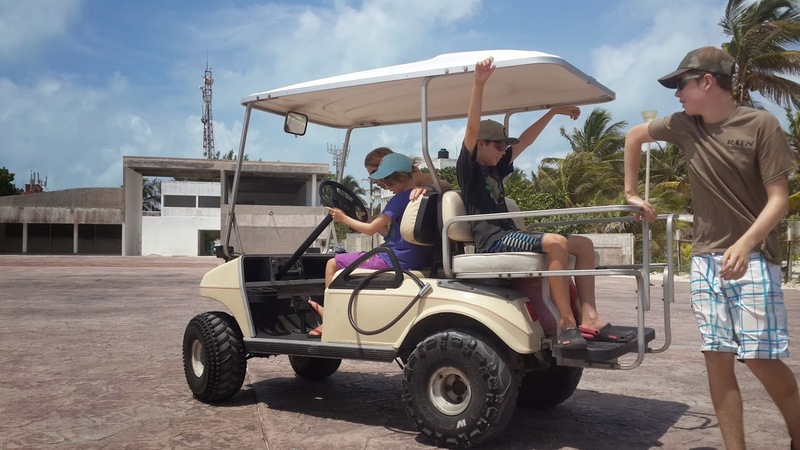 Yesterday we went on a trip to see what there was to see on Isla Mujeres. Since this is an island there aren’t very many cars so we rented a golf cart. The cart had a bench at the front and a bench at the back. Mom and Dad sat at the front and Christopher, Katie and I sat in the back facing backwards. It was kind of novel and we had lots of fun driving around. We saw a lot of Isla Mujeres and I can tell you that it really isn’t that different from home. Chedraui is the big grocery store on the island. It is quite a landmark - there are street signs all over pointing you towards it. It is a little more touristy. There were a lot of tour agencies where people would call out at tourists and try to sell their tours, but that isn’t all that different from anywhere else we’ve been. There were lot’s of little café restaurants too. Rockin' the back of the golf cart. After a bit of driving around we stopped at an empty lot and Christopher, Katie and I all got turns driving the cart around. It was pretty fun and the cart went slow enough that Christopher and I were jumping on and off the back. It’s kind of crazy to think that in a year I’ll be learning to drive for real. I am only fourteen now but my birthday is like, a week and a half away so I’ll be learning to drive kind of soon. Everyone got a turn learning how to drive the golf cart. Checking out the view at Punta Sur, the south point of Isla Mujeres. After driving around the lot, (Christopher’s favorite part of the day) We went to a little café on the corner of a street and got lunch. It was sort of a brunch café so lot’s of us got breakfast stuff. This food was awesome! I had two crepes full of fruit, Katie had crepes with banana and nutella chocolate, Mom had some omelets and it was all sooooo good. My crepes were so big I only managed to get through one of them. Next we went to another side of the island where we looked over a cliff facing the sea with some statues and a lot of iguanas. The biggest iguana we have seen so far (not sure if you can tell from the picture, but it is a statue). The lizards were almost invisible when you weren’t paying attention. They blended in perfectly with the rock. This one was real. He was just hanging out above the surf, trying to look like part of the rock. There was also a statue garden further out on the cliff but there was a fee to get in so we just admired it from afar. Further back from the cliff were a ton of little huts selling t-shirts and wood carvings and all kinds of crazy souvenirs. Mexico is good at making the most of the tourist dollar at every single attraction. Christopher did look at some sunglasses having lost his a few days ago but didn’t find a good pair. Pretty soon we will be setting out across this ocean on our boat. After that we came back to the marina and had a swim to cool off. We should be at Isla Mujeres for a week if the plan doesn’t change (don’t worry it will) and we will keep you posted on all the sailing stuff. There is a ton of cool stuff we saw that I haven’t written about but I’ll put lot’s of pictures on. There was a zip line operation right over the water. We checked it out, but didn't go on it. You can see Cancun on the mainland. Thanks Keith. Yes, the golf cart was a blast. The kids enjoyed getting a chance to drive it, too. The whole trip was amazing. We are home now, and getting back into our normal routines, but will remember the trip for a lifetime. Hope you get a chance to do something similar!